I recently paid a visit to New Orleans Seafood, a fairly new seafood and po' boy sandwich shop in Duluth. 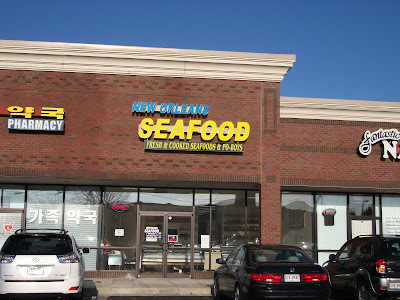 This shop piqued my interest early on (it caught my eye during my frequent trips up and down Pleasant Hill Road), but it was through Chow Down Atlanta's post that I found out that the place had finally opened up. Always down for a po' boy (I lurve them so), I popped in to give them a try. A Louisiana native (who I chatted with while waiting for my order) put in a good word for their grub so that's always a good sign. The po' boys are reasonably priced (if I remember correctly, the most expensive sandwich will run you about six bucks) and include one side item. 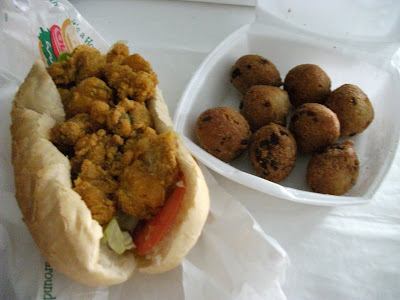 I decided to go with an oyster po' boy and a side of hush puppies. I loved the little hush puppies (which I gobbled up rather quickly). They were nice and light, not the heavy greasy balls of dough you sometimes get at other places. Loaded with a generous serving of fried oysters and dressed with lettuce, tomato, pickle and mustard (no mayo per my request), my po' boy was pretty decent as well. Sure, it might not be as good as what you'll find back in Louisiana, but it was still tasty. The menu also includes other New Orleans treats like boudin balls and andouille sausage. Fresh seafood (including frog legs, crabs and of course crawfish) is available for purchase along with assorted Louisiana spices, bottled sauces and seafood breading mixes. They even sell packages of Camellia dried red kidney beans (for those traditional Monday "red beans & rice" dinners). Great little place. I hope they can survive becoming popular! The wait on my last visit was fairly long.